Beginning with Windows 10 Creators Update (version 1703) and continuing with Fall Creators Update (version 1709) Microsoft removed the settings that let you change the font size for title bars, menus, message boxes, tooltips, palette title, and icon text. If you’re using a very high screen resolution, you may find yourself straining to read the text in message boxes, title bars, etc. after updating to the Creators Update or Fall Creators Update. Prior to the Windows 10 Creators Update (version 1703), you could easily change font sizes in Display settings. 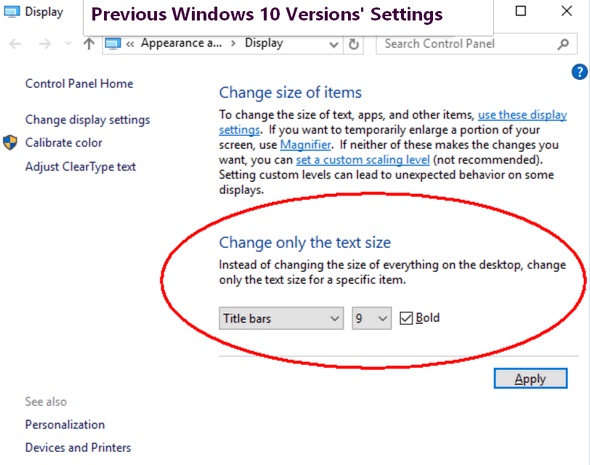 Their are thousands of tips all over the web about editing the registry in order to bring back font size settings options in Windows 10 Creators Update. But editing the registry is not for everyone, plus it’s time consuming — and if you make a mistake it can cause big problems. Luckily, for those of you, who have updated to the Creators Update or Fall Creators Update and now find themselves with Windows display fonts that are uncomfortably small, there’s a very small (less than 50 KB) free program you can download that makes it very easy to change the size of the fonts for title bars, menus, message boxes, tooltips, palette title, and icon text. It’s called System Font Size Changer. All you have to do is download it and run it. It does not install – so all you do is download, unzip and click the exe file to run it. Since it does not install, no worries about malicious stuff like PUPs, malware, bundles or other baddies. And a really nice feature of System Font Size Changer is that when your first run it, the program will offer to save your current settings – and we suggest you take advantage of that… just in case. 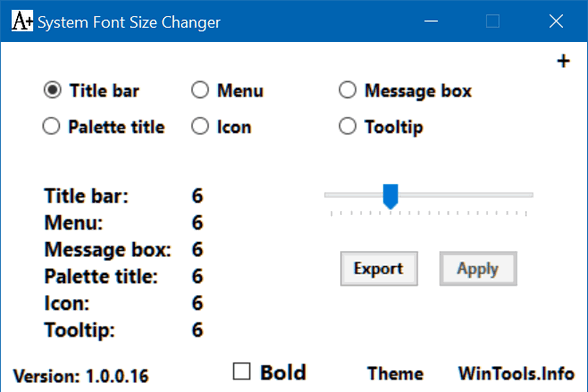 If you want an easy way to change the system font size on Windows 10 Creators Update (version 1703) and Widows 10 Fall Creators Update (version 1709)( download System Font Size Changer from WinTools. It’s free and it will make your life easier. See all our Cyber Week specials here! I’ve really needed this feature since getting the V1709 update. But I can’t seem to work your instructions on how to use this text converter. When I click on the double-arrow icon, I get a page with a search box and several icons, such as Amazon, Walmart, Yahoo, etc. What am I doing wrong? Thank you, thank you, thank you! I have been trying to figure out how to make the font bigger on my Windows 7″ tab for ages. The Windows 10 Creator Update installed the other day. Everything was at 9 pts. I could barely read it. Then I came across your suggestion for the Font Size Changer. Yay! Finally, I can read ! Goodbye Magnifying Glass; hello Font Changer. Cloudeight, you are a New Year’s Blessing! HAPPY NEW YEAR TO YOU BOTH! Awesomeness does not do you guys justice! You are the best!